Access — where can you get to soon? — is, or should be, the core idea of transportation planning. David Levinson has long been one of the leaders in quantifying and analyzing access, and this work kicks off this fine new book. The cover — a 1925 map showing travel times to the centre of Melbourne, Australia — captures the universality of the idea. Access is what I prefer to call freedom: Where you can go determines what you can do, so access is about literally everything that matters to us once we step out our front door. But that’s just the beginning of this very friendly book. Elements of Access is really a tour of the whole field of transport planning, and its goal is to strike a balance between academic precision and readability. In this, it’s a great success. I’ve never taken more pleasure from reading academic writing about transport. The writing is mostly clear and easy to read, and deftly combines technical ideas with references to everyday life. The book is also easy to browse. It’s organized in units of 1-2 pages, grouped under six themes. Photos are used well. Footnotes appear in the otherwise white space on each page, so that there’s no flipping to them, and interesting nuggets in them have a chance to catch your eye. The book is also full of internal references, aiming for the structure of a hypertext to the extent that a physical book can. I first caught this review on Twitter. I am grateful it has been retweeted so many times and favorited even more. Now all of you should purchase the book! At the end of his review Jarrett notes we didn’t cite his book, Human Transit, which is an unfortunate oversight which will undoubtedly be corrected in the second edition. You should read his book too. A review of Human Transit by Kari Watkins can be found in JTLU 5(3). 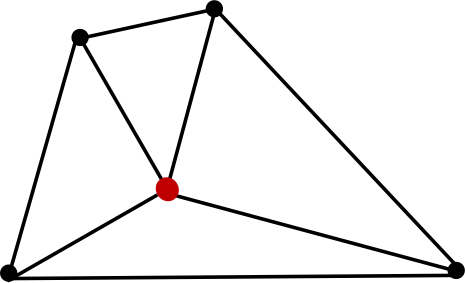 In binary networks, the focus is on whether or not a connection between two nodes exists. However, not all links (or nodes) are created equal, particularly when it comes to transportation networks. When we know about the presence of a link as well as the strength of that link, it is called a valued network. For instance when traveling from A to B in a street network, there is usually discontinuity in street type. In other words, one might move from a local street to a collector road to an arterial road and then back to a collector before reaching their destination. While engineers know this sort of differentiation as functional classification, it is also referred to as hierarchy. Hierarchy, which is embedded in many natural and societal systems such as biologic cells and the Internet, is a common transportation complexity that requires a more complicated topological analysis (Tomko, Winter, & Claramunt, 2008). Typical topological measures such as Degree or Betweenness can be useful in helping understand network hierarchy, particularly in tree-like networks; however, such measures would fail to properly distinguish between streets in a gridded street network. In the above version of Metropolis’ street network, the major streets are represented by thicker lines and easily discerned, even in a gridded network (Fleischer, 1941). Using the basic set of topological metrics, we would have no idea that 8th Street is functionally different from 7th Street or F Street from D Street. These metrics fail to consider attributes – such as urban design, number of lanes, active transportation infrastructure, adjacent land uses, and speed – beyond network structure and would not necessarily be able to distinguish such streets. Working with hierarchical networks often involves dividing networks in multiple layers or tiers. Measurements of heterogeneity have also become common proxies for characterizing hierarchy. To identify heterogeneity among street segments, researchers have used entropy measures as well as discontinuity measures (Xie, 2005). Discontinuity, for example, does not necessarily denote a disconnected network; rather, the reference is to the discontinuity in moving from one street type to another. If we sum the number of times a traveler goes from one type of street to another while traveling along a shortest path route, we find the trip discontinuity. Dividing that number by the length of the trip gives us the relative discontinuity (Parthasarathi, 2011). Other simplistic hierarchy measures calculate the relative percentage of a particular type of road. For instance, we might divide the number or length of arterials by the total number or length of roads to find the relative percent arterials (Parthasarathi, 2011). Interestingly, it is not uncommon for large-scale transportation models to delete streets on the lower end of the hierarchical spectrum (i.e. local streets) for the sake of computational efficiency. 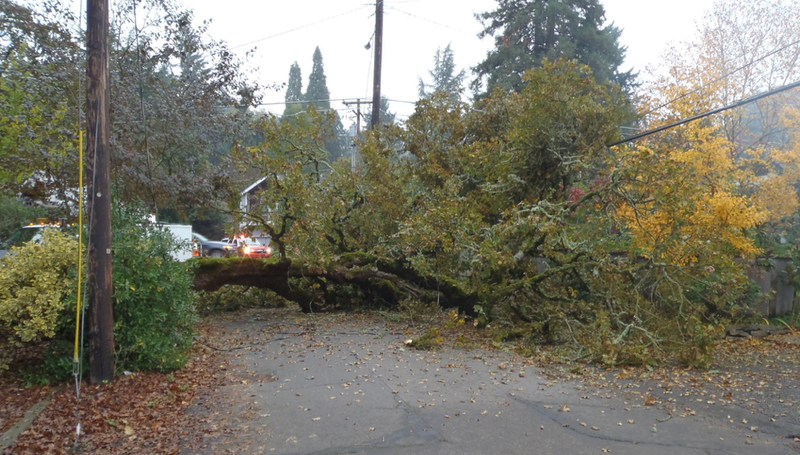 Yet, removing such streets creates a bias against more connected networks because less connected networks typically need to be supported by major streets with more capacity than would be needed in more connected networks (Bern & Marshall, 2012). Some topological researchers – where the focus should be on understanding the full network – unfortunately reach the same conclusion: “urban streets demonstrate a hierarchical structure in the sense that a majority is trivial, while a minority is vital” (Jiang, 2009). If we only care about vehicle traffic flow, such statements may be true. However, my previous street network research confirms that understanding the full network holds the key to pushing toward improved safety, increased active transportation, and better environmental and health outcomes (Bern & Marshall, 2013; Marshall & Garrick, 2009, 2010a, 2010b, 2012). When we have nodes or links with high Betweenness values, it is often because our network is split into various sub-groups that can be called clusters. Clusters tend to have their own unique set of properties, so it is useful to be able to identify clusters quantitatively. While there are a growing number of clustering algorithms, the basic idea behind them is to capture the degree to which nodes cluster. 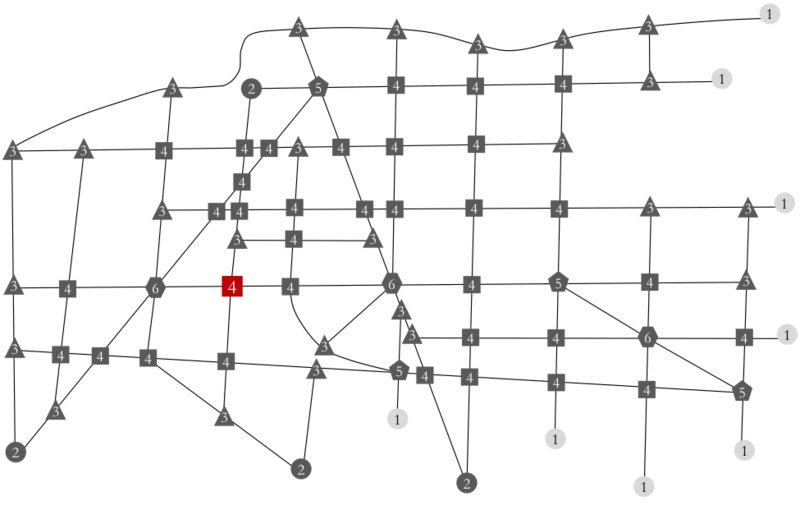 The Clustering coefficient, for instance, represents how likely is it that two connected nodes are part of a larger group of highly connected nodes. It can be calculated by dividing number of actual connections between the neighbors of a node (i.e. the nodes directly connected to the node in question) by the number of possible connections between these same neighboring nodes. 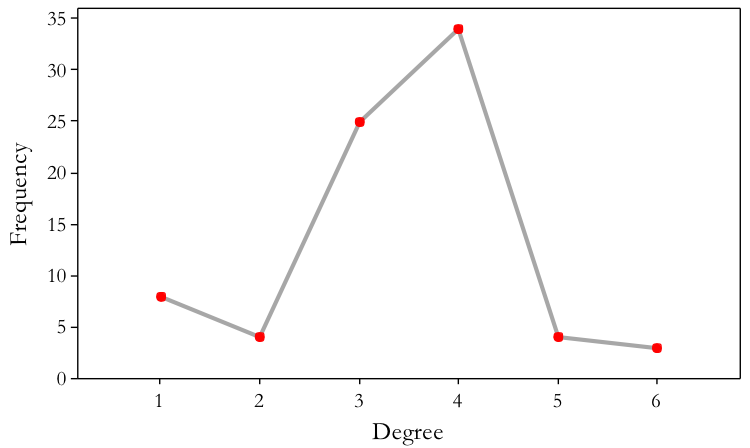 For instance in the image above, the red node is the node of interest, and it has a Degree of 4. Those 4 neighboring nodes make 4 actual connections (i.e. the black lines in the figure on the right) but have 6 possible connections (i.e. the black lines plus the red dashed lines). 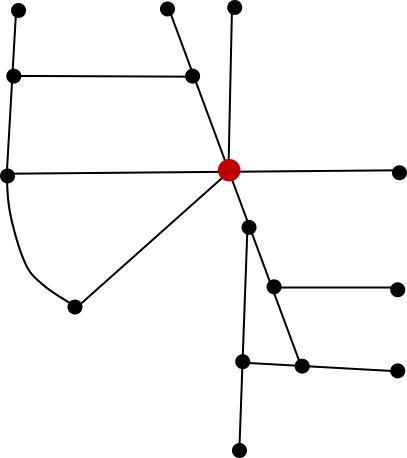 Thus, the Clustering coefficient for the red node is 4 divided by 6 or 0.67. The value represented by the Clustering coefficient ranges from 0 (i.e. no clustering) to 1 (i.e. complete clustering). If we are interested in the amount of clustering for an entire network, we average the Clustering coefficients for all of the nodes. Clustering tends to be higher in real-world networks than in random networks. So when a network becomes more centralized (i.e. a small percentage of nodes have high connectivity), the overall topology becomes more differentiated and clusters begin to emerge. Other related terms include component and clique. 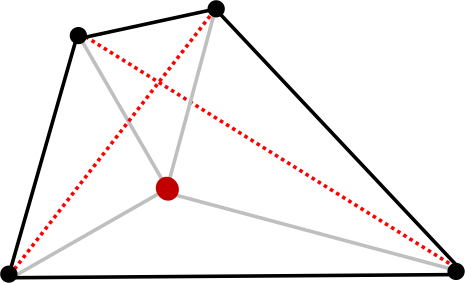 When a given sub-group of nodes is also highly connected, that is called a component. When the nodes in a component have few connections to other nodes outside of the component, that is a clique. Understanding clusters, components, and cliques in networks can be useful because they can hold more influence over behavior than overall network structure (Neal, 2013). Imagine, for instance, a New Urbanist neighborhood with great street connectivity set into a city with poor overall street connectivity. Analyzing network structure for the overall city might lead us to one conclusion; yet, we could find very different outcomes in the New Urbanist neighborhood. While factors such as land use, street design, and demographics influence transportation-related outcomes as well, the concept of clustering holds value for those interested in truly understanding transportation networks. Degree is often good for measuring local circumstance, but adequately characterizing centrality is a bit more complicated. When trying to figure out centrality in terms of how connected and influential a node or link is, it is useful to get a sense of relative network flow through a particular node or link. Betweenness measures attempt to capture this relative flow by quantifying the number of times a node or link is on a shortest path between two other nodes. The first step would be to calculate the shortest path between every origin and every destination. Next, we count the number of times that a particular node or link shows up on a shortest path. The resulting number represents the relative role of a node or link as a connector between clusters of nodes or links. In the above street network, the intersection highlighted in red must be included in over half of the shortest paths. We call this count Betweenness, which is essentially an attempt to quantify how necessary a node or link is to get from one side of the network to the other. The Panama Canal, for instance, is a key maritime link connecting the Atlantic and Pacific Oceans. Without it, ships would have to route around Cape Horn at the southernmost tip of Chile or through the Straits of Magellan. For a ship traveling from New York to San Francisco, the Panama Canal – due to its high Betweenness value – cuts more than 7,500 miles from the journey. In terms of other transportation issues, Betweenness usually relates to metrics such as accessibility and traffic congestion. In addition to revealing relative importance, Betweenness also indicates how irreplaceable a node or link may be to a network. In other words, what happens if we remove a certain node or link from the network? Very high betweenness values can indicate a critical connection between various groups of nodes or links. In some cases, this represents a vulnerability where we would want to add redundancies to the network. In transportation networks, if we assume all travelers take the shortest path and treat each traveler as having a unique origin and destination, Betweenness is the same as the flow (number of travelers) on the link. We call this Flow-weighted Betweenness. Centrality measures help gauge the overall importance of a node. In other words, how connected and how influential is a node within the overall network? One of the simplest measures of centrality is Degree, which measures the number of connections between a node and all other nodes. For instance if we are considering a street network with intersections as nodes, a nodal Degree of 4 would indicate a typical 4-way intersection. The image above depicts a rendition of the Metropolis street network with a Degree value shown at each intersection and a 4-way intersection highlighted in red (Fleischer, 1941). When we focus on what is happening at one particular node, it is called the ego network (in that we are looking at the network from the perspective of a single node while ignoring all nodes not directly connected, which can be deemed a bit narcissistic). The entire network can be called the complete, whole, or global network. So if we want an overall Degree measure, we can calculate Average Degree, which is the average number of connections for all the nodes within the overall network. When the Average Degree exceeds 1, every node has at least one connection, on average. When the Average Degree approaches log(n), where n equals the number of nodes in the network, every node starts to become accessible from every other node (Neal, 2013). For the Metropolis network, there are 78 nodes with an Average Degree of 3.4. Analyzing Degree measures for a complete network also entails generating a Degree Distribution, which literally equates to the plotting the frequency of each Degree for all the nodes as shown in the image below for the Metropolis street network. The idea is to try to capture the relative differences in connectivity between the nodes in order to gain a sense of network structure. For instance, every node in a homogenous network would have the exact same number of connections and not much of a distribution. A more centralized network might have one node with a high Degree value and all other nodes with low Degree values.